Dogs were domesticated from wolves tens of thousands of year ago - though what exactly it is, at the genetic level, that distinguishes dogs from wolves, is unclear. Amanda Pendleton and Jeffrey Kidd, authors of a new study in BMC Biology, explain how they utilised new genomics technology - and village dogs - to address this question. Two village dogs in Marrakech, Morocco. “Dogs” (CC BY 2.0) by L.Wi. The dog has been man’s best friend for thousands of years, forming a relationship that pre-dates the establishment of agriculture. Domesticated animals, including dogs, share a distinctive collection of traits that distinguish them from their wild ancestors. Changes in fur color and texture, the shape of ears, tail length and its curvature, eye color, and alterations in facial structure are some traits distinguishing dogs from wolves. Yet, the trait that most importantly differs is behavior. Thousands of years ago, dogs were tamed and domesticated from wolves, which over time yielded animals that were more and more friendly with humans, transforming the once wild creatures into the domestic dogs of today. With the advent of modern genomics technology, a number of approaches have been used to search for the precise genetic changes that turned wolves into dogs. The appearance of the gray wolf is very different from the look of modern dogs. “Posing wolf” (CC BY 2.0) by Tambako the Jaguar. We recently participated in a study that that used DNA from ancient dogs that lived among humans to address outstanding questions related to the timing of dog domestication. Ancient DNA technology is a genetic time machine, allowing researchers to directly see genetic variants that existed in the past. When we assessed the genetic makeup of three European dogs from the Neolithic (five and seven thousand years old), we found something surprising: although genetics indicated that the three samples were clearly dogs, they carried the wild wolf sequence at many parts of the genome that were previously thought to be associated with domestication. To explain this conundrum, in our new publication in BMC Biology, we turned to village dogs, which represent the vast majority of dogs on earth. These dogs are semi-feral, roam along our streets and cities, survive mostly off human trash, but most importantly, they are domesticated. 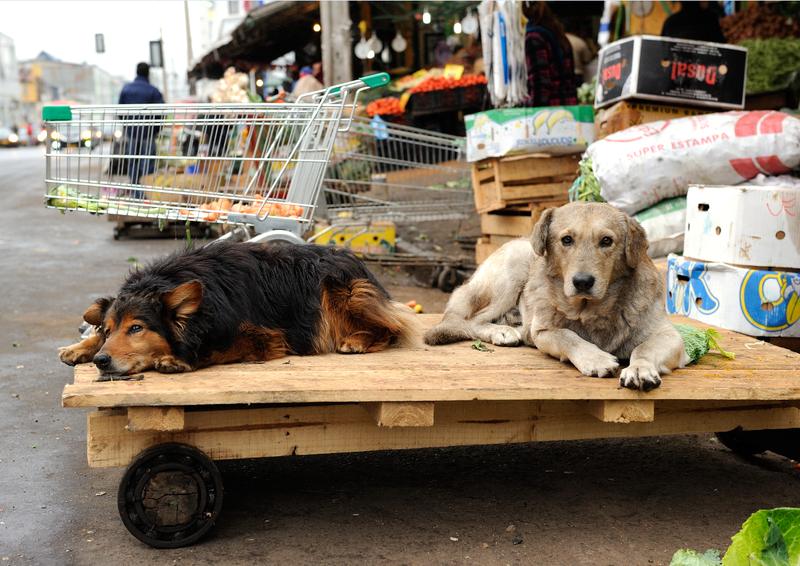 Village dogs, such as these lounging in a market in Chile, are common sights on busy city streets. “Stray Dogs in Valparaiso, Chile” (CC BY 2.0) by Tim Adams. In fact, these dogs are descended from the same ancestors as our favorite breed dogs today, and have been likely living with or near humans since the time of domestication, which occurred as long as ~40,000 years ago. Free-ranging village dogs serve as rich genetic resources, giving scientists a glimpse at the full range of genetic diversity and what it really means to be a dog. Since the domestication of wolves thousands of years ago, dogs have slowly lost genetic diversity, but village dogs maintain much more. Much of what makes dogs look and behave the way they do is determined during their early development as an embryo. By the time dog puppies are born, their appearance and behaviors are already different than wolf puppies. A village dog mother nurses her diverse-looking pups on a streets in Cairo, Egypt. “DSC_0227” (CC BY 2.0) by RachidH. These changes reflect the outcomes of complex and intricate processes during embryonic development and involve the movement and coordination of many cells that serve unique purposes. A few years ago, a group of researchers noticed that the diverse phenotypes of domesticated animals can be explained by differences in neural crest cells, which are stem cells that travel from their starting location, in what will become the spinal cord, along defined routes to their final destinations. 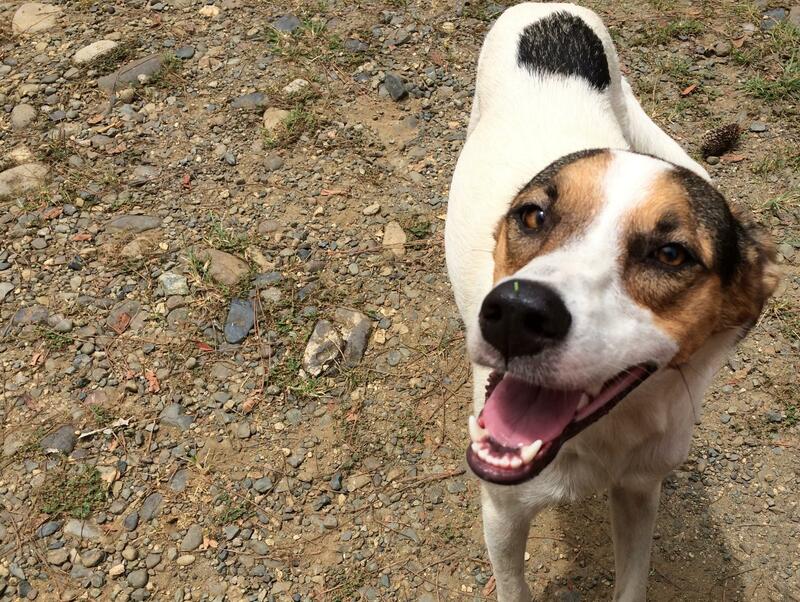 A village dog in Fiji poses for a photo. Photo taken by Adam Boyko. Neural crest cells play a major role in defining the forms and functions of multiple tissues in all animals with backbones including most of the skull, face, cartilaginous tissues (such as dogs’ infamously charming floppy ears), and even pigmentation of the skin and fur. In addition to changing the outward appearance, these cells ultimately contribute to the development of the brain, nervous system, and adrenal systems, all of which can influence behavior. Changes in the number or activity of neural crest cells in any of these final body locations can subsequently alter the size, shape, or level of expression of the corresponding trait. 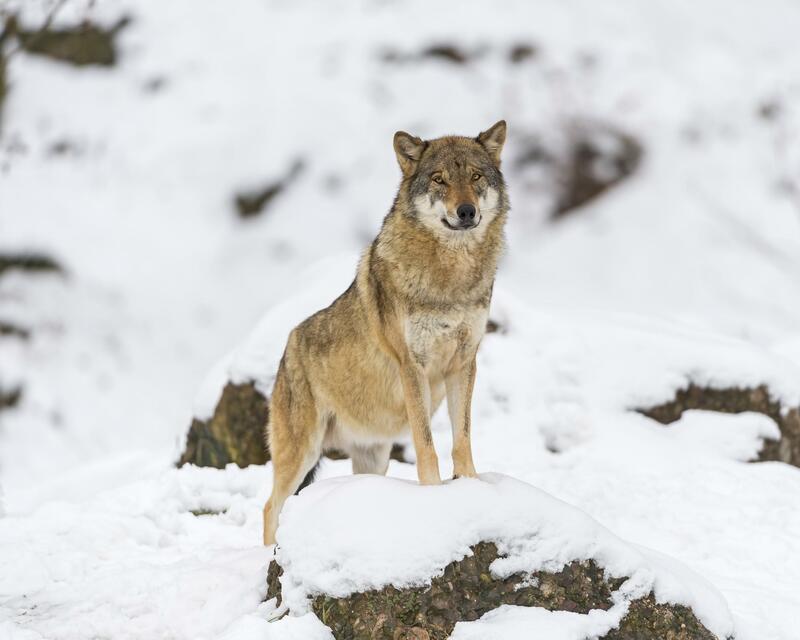 What can the genomes of dogs and wolves tell us about domestication? By comparing the genetic diversity of village dogs and wolves we identified 246 regions of the genome which may have been altered during domestication. By using village dogs, which have not had a recent loss of diversity due to human directed inbreeding, we were able to find old events shared among living dogs and the ancient samples from the Neolithic, suggesting that we identified changes associated with the domestication process. Interestingly, these changes were found near genes that perform critical functions in the developing dog, including many genes that are associated with the neural crest, nervous system function, and circadian rhythms. These findings offer clues to the genetic changes associated with domestication, and support the hypothesized role of alterations in neural crest cell function in this process. Michelle White and Ryan Boyko collect DNA from a village dog in French Polynesia. The precise details surrounding the process of domestication remain a mystery, but researchers can link archeological evidence with the patterns observed in genomes to help evaluate possible theories. One scenario suggests that in ancient times wolves lived near early human settlements, as they were attracted by trash or remains of hunted animals. Over time, some wolves may have become less fearful of humans, as these may have had more success in obtaining food. During this gradual process, referred to as self-domestication, researchers hypothesize that genes involved in the neural crest pathway were slowly changing, leading to a wide range of different appearances relative to wild wolves and leaving signatures in the dog genome that we can detect today. At some point, humans began their active involvement in domesticating these “less wild” wolves, who already likely had a head start on the process, and other physical traits may have continued to accompany the behavioral changes. Debate remains about when humans became directly involved in this process, but linked morphological and behavior changes can rapidly occur, as was found in the selective breeding of silver foxes. 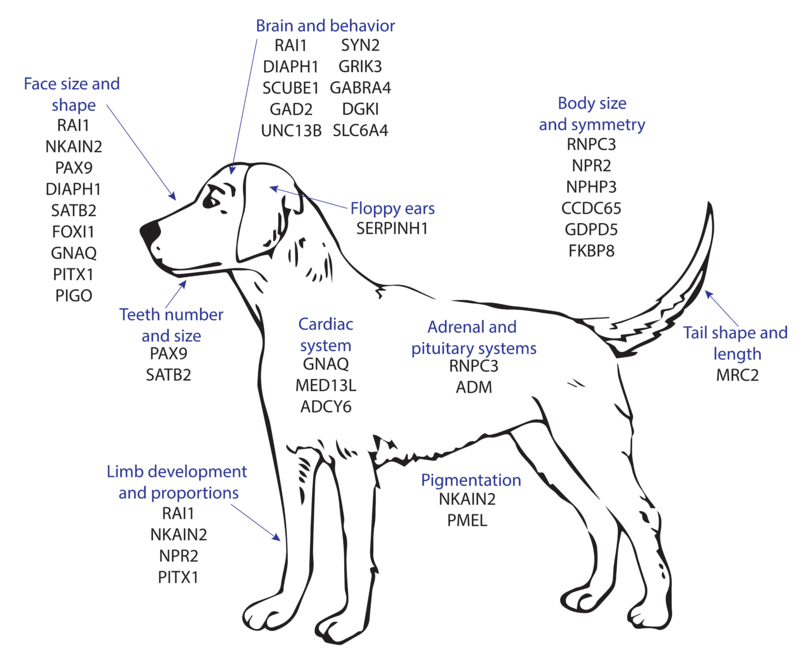 Genes that are directly or indirectly linked to phenotypes that distinguish dogs from wolves. Our study identifies these genes as candidates for further study. Image inspired by Wilkins et al. 2014 Genetics. Unraveling the mysteries of when wolves became dogs, how and why this happened, and how the domestication process affected modern dogs will not only help us understand the history of our furry companions, but also identify genes that may be pivotal to dog development and behavior. As more ancient dog and wolf samples are discovered and analyzed, we may soon be able to answer the many remaining questions regarding how dogs came to be. Growing up in Florida with many family dogs, Amanda fell in love with the study of nature. After earning her Ph.D. in Plant Molecular and Cellular Biology at the University of Florida, she began a post-doc at the University of Michigan studying canine evolution in the lab of Dr. Jeffrey Kidd. Her research focuses on the evolutionary history of dogs and wolves, as well as genome variation across canine populations. Dr. Kidd received his Ph.D. in Genome Sciences from the University of Washington where he studied the impact of genomic structural and copy-number variation. As a postdoctoral scholar at Stanford, he used population genetics models to understand the history of human populations and became fascinated with the evolution of modern dogs. Since 2012, Dr. Kidd has been at the University of Michigan where his lab studies the causes and consequences of genome variation as it relates to evolution and human disease.